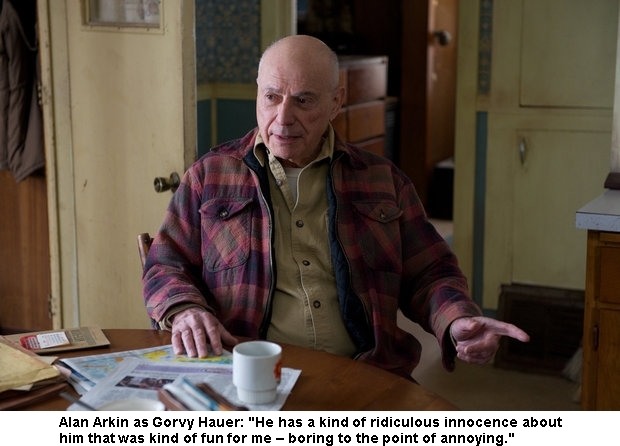 In the dark crime comedy Thin Ice Alan Arkin plays Gorvy Hauer, an old man in possession of a valuable violin that crooked insurance agent Mickey Prohaska (Greg Kinnear) is desperate to get his mitts on. Director Jill Sprecher shot her Kenosha, Wisconsin-set film in Minnesota in the snowbound winter and the memory of that frigid location elicits a cringe and a snort of laughter from Arkin. Arkin is taking a few minutes to chat while he waits for a car that will take him to the Salt Lake City airport after a screening of the movie – then called The Convincer – at the 2011 Sundance Film Festival. He worked with Sprecher and her co-writer sister Karen before on 2001’s Thirteen Conversations about One Thing and that experience was so positive that when he came on board the new movie it was not just as an actor, but as an executive producer. It is only the second time he’s that done that – the last time was in 1979 when he made The In-Laws. It was also the perfect situation for Arkin, who at 77, no longer wants to tolerate the confinement of a script. He’s an actor who likes to play and Sprecher gave him the room to do that. “I’m too improvisatory,” he says. “I need to play. I’m not happy being locked into something tightly. And it’s getting more that way. I used to be able to submit to a script word for word. I can’t find it in me to do it anymore. Arkin made his screen debut in Norman Jewison’s 1966 ensemble Cold War comedy The Russians Are Coming, The Russians Are Coming, garnering a Best Actor Academy Award nomination for his efforts. He won an Oscar for Best Supporting Actor for his role in yet another ensemble comedy 2006’s Little Miss Sunshine, the film that also marked his first time acting opposite Kinnear. Thin Ice with a cast that includes – in addition to Arkin and Kinnear – Billy Crudup, Bob Balaban, David Harbour, and Lea Thompson is another group effort, a further enticement for Arkin to sign on to the movie. Arkin’s attitudes about humor, improvisation, ensembles, and an actor’s place within a play or movie were shaped early. In 1960, he joined the fledgling Second City troupe in Chicago. In An Improvised Life, the memoir that he published last year, Arkin wrote that he considers his time with the group to mark the real start or career. He feels that way despite the fact before he joined Second City, he was a musician and composer (he co-wrote “The Banana Boat Song,” made famous by Harry Belafonte) and had even already tasted improv in 1959 when he joined the Compass Players in St. Louis. “If I know anything at all about comedy it’s from working at Second City,” he says. “I didn’t think I was funny at all when I got there. I had to learn. It came through working on characters. Now I don’t feel like I’m particularly funny as me, but when I put on a particular character I feel like there’s humor in that. In a nutshell, of all the myriad things I learned there, the two most important were, first, we were allowed to fail. People used to come to the theater and know that 30% of what they saw every night was not going to work, because it’s improvisatory and they knew if the first thing’s not going to work, then the next thing might be great, something they’d remember 50 years later. That was an enormous thing, the fact that we took chances every night. That was the first thing. These days he puts that training to use on nearly every movie he makes. He’s written screenplays and directed movies and plays. He can see where scenes need work and dialogue needs tweaking. Before he signs on to a film, he talks it over with his director to make sure that he will have the leeway he needs to improvise. “People recognize that that’s the way I work and it doesn’t seem to hurt the films adversely, so they take a deep breath and jump in with me,” he says.